Siddhartha Gautama was one of the most pioneering thinkers who revolutionized the very manner in which man used to think, act and operate at mundane levels. Long before Magna Carta or the American Constitution came into being, Buddha told us that no man is unequal to the other; long before these modern-day social-scientists castaway the discriminatory caste system in the Asian world, Buddha showed us by example that man is not born a Brahmin or a coolie, but his action alone defines the lines of such divisions among man and women; that alone would shape and explain whether he is one or the other. Such sophisticated and erudite thinking has endured its own corruption specifically by the order, Buddhist clergy, and still guiding us in trying times telling us right from wrong, good from bad and reasonable and unreasonable, all of which qualities that set the human being apart from all other species. Siddhartha’s attainment of a supreme state of mind- Buddhahood- set him apart from all his contemporaneous thinkers and philosophers until this day. Although we, mostly Sinhalese Buddhists, believe in the philosophy taught and preached by Siddhartha Gautama, the Buddha, we cannot or should not disregard another school of erudite thought, a very classical group of doctrines and social theories that attempted to analyze and dissect human behavior at a fundamental level and present quite a sophisticated macro philosophy. Socrates, Plato and Aristotle, the ancient Greek thinkers were amongst the initiators of this thinking which formed the foundation of western philosophy. Plato writes in his ‘Republic’, “until philosophers rule as kings or those who are now called kings and leading men genuinely and adequately philosophize, that is, until political power and philosophy entirely coincide, while the many natures who at present pursue either one exclusively are forcibly prevented from doing so, cities will have no rest from evils,… nor, I think, will the human race.” (Republic). Socrates, who was a contemporary or a one who roamed the cities of Greece with his exquisite dialogue and immensely wise discourses in the aftermath of Buddha’s ‘Maha Parinibbana’, prescribed a set of dialectical and logical thinking for the ordinary man to understand and attain. Yet it did not happen. Majority in Greece, as in other parts of the world, was more ready to accept an easily marketable religious merchandize- the concept of ‘God’. Clouded by the avaricious orders of organized religions, the clergy, wisdom and intellectual curiosity of a few could not withstand the onslaught of politically sweetened storms; nor did they create novel ways and mechanisms of how to take a sophisticated thought and teaching into the next level of mass-comprehension. History bears testimony to the fact there only a handful of religious leaders who dared the prevalent thought and practices and became successful to create a ‘religion’ that would later add to itself the essential meat and bone in order to endure and embrace mass participation at the multiple rituals that ultimately was mistaken for the essence of the central gospel of the teacher. This has happened to all religions and Buddhism too was not spared of this debasement of the core teaching. Politicians identifying the magic of man’s vigorous faith and unbending allegiance to the religious order began cultivating these various orders and sectorial leaders. Amongst many allurements offered by politicians to cultivate and sustain this relationship between politics and ‘religious order’ are money and tangible offers of rebuilding of temples and provision of material assistances. In a real and perceptible sense, the context of political thought and action has changed beyond recognition. Sri Lanka is no exception in this contextual transformation; her ancient history as well as the recent post-Independence timespan, politician’s dependence on Buddhist Temple has grown exponentially. While our monarchical-rule in the ancient past was more or less equal to a theocracy, introduction of democratic elements such as universal suffrage and Westminster rules of Parliamentary affairs has embellished the mind of average Sri Lankan..
What transpired last Friday, October 26, was the swearing in of an ordinary parliamentarian who also happens to the former President and the chief antagonist of the governing coalition which was elected on a platform of anti-corruption, anti-nepotism and anti-dictatorial rule by the very man who opposed him. The country was in a profound shock; it may have taken one half day for almost everyone, whether one favored or hated the news, to gather from the ensnaring limbo of a collapsing value system. The system that sustained a civil service that was apolitical in every sense of the word and resisted its own corruption by selecting the best of the best students who passed out of the Universities at the time now has become the victim of an extremely corrosive political intervention at every level of governance. Arthashastra, the Eastern counterpart to Plato’s Republic, authored by Kautilya, also known in history as Vishnugupta and Chanakya, the teacher and guardian of Emperor Chandragupta Maurya, went to the same or even greater extent to define and term the ideals of a just polity. Chanakya also prescribed a very workable and practical blend of socio-economic-political strategies and tactics with a sublime purpose of attaining a perfect union between the ruler and the ruled and also with total and dynamic equilibrium between the two parties. However, when one comes down to earth and sees what’s occurring in Sri Lanka today, all these teachings of the Buddha, Confucius and Chanakya of the East and Socrates, Plato and Aristotle of the West seem meaningless. Especially in the context of the developing culture of corruption, nepotism and resort to means of ‘Stalinist’ approach to power, erudite political philosophies flow out the window in a hurry. Transformation of politics from civil to evil has already begun. A civil transformation of power within the constraints of our Constitution is not only a necessary element of good governance; it is also a political probability. That is why negotiations between the aggrieved parties in this confrontation, President Sirisena and Prime Minister Wickremasinghe, should have been towards a more amenable and acceptable candidate for the position of Premiership within the coalition that brought Sirisena into power. That is where the fundamental misjudgment and error were committed. Whether it was willful or as a matter of oversight due to the rush of problems that confront a President as the arbiter-in-chief of governance machinery is of no less significant than otherwise. Both paradigms are as problematic in the larger scheme of things. What is even more severe is the total collapse of the governing machinery at all levels. 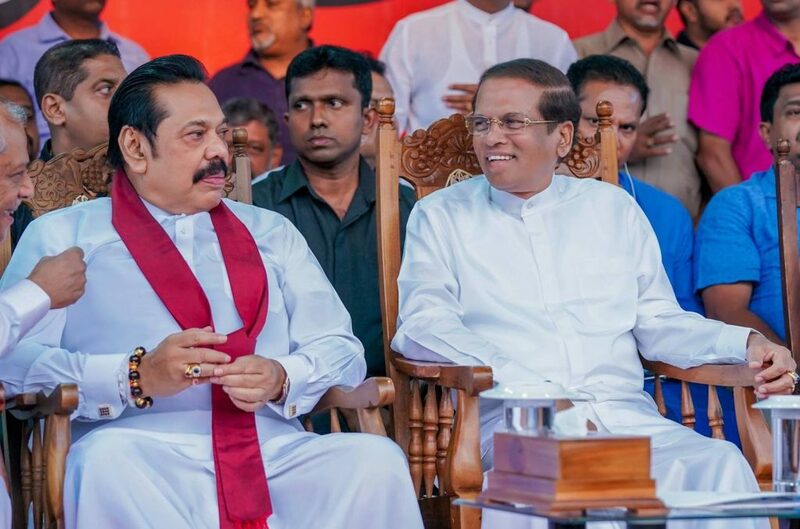 The total focus of the new Cabinet and parliamentarians seems to be on whom to persuade to leave their current affiliations to the United National Party (UNP) and join the emerging political reality of another Rajapaksa-led ‘Joint Opposition’. The confusing realities of non-democratic alliances and political machinations have produced a new reality of parliamentarians being treated as cheap merchandize for buying and selling in the open marketplace. Such devaluation of those who have been elected to high office is a direct affront to the supreme teachings of Chanakya in the East and Socrates and his fellow philosophers in the West. Both, Chanakya’s ‘Arthashastra’ and Plato’s ‘Republic’ have been thrown into the dustbin of contemporary back-channel lobbying. Trading of politicos for the convenience of coming into or staying in power has come to occupy supreme significance. This disgraceful practice of buying and selling of politicos for attainment of power is not new in the history of man. Nor would it come to a sudden halt in the future. But the clever and intelligent ones who still possess some modicum of civility, grace and self-respect would reckon that what must be denied and rejected for the sake of civility and inner progress of society must take control of the situation and demand that justice prevails. ‘Justice’, as defined in terms of Socrates’s teachings is that ‘it is to your advantage to be just and disadvantage to be unjust’. 2. Negotiate with both Ranil Wickremesinghe and Maithripala Sirisena and find a third person to be the Prime Minister and continue with the same Cabinet and government party as it existed prior to October 26. 3. Fight the new reality of seemingly unconstitutional act and persist with the demand that Ranil Wickremasinghe’s position as Prime Minister be restored before any other resolutions are considered. Then resolve the matter of Wickremesinghe’s future as head of the Government with an acceptable and third candidate who is capable to mustering the support of the coalition that brought the current President into power. The reality of transformation of politics from civil to evil has dawned!